A couple of week’s ago, Tickled Pink Fancy Dress got in touch to see if I wanted to take part in their fancy dress challenge. It’s me, so of course I couldn’t say no! I love any excuse to dress up, especially if it’s fancy dress attire! So I had a good browse over the website and chose my favourite outfit, which is this gorgeous 1920’s inspired Fever Flapper Dress*(£19.99)! For those of you who don’t know, I adore the 1920’s, I actually styled one of my textile’s coursework’s around that roaring time! 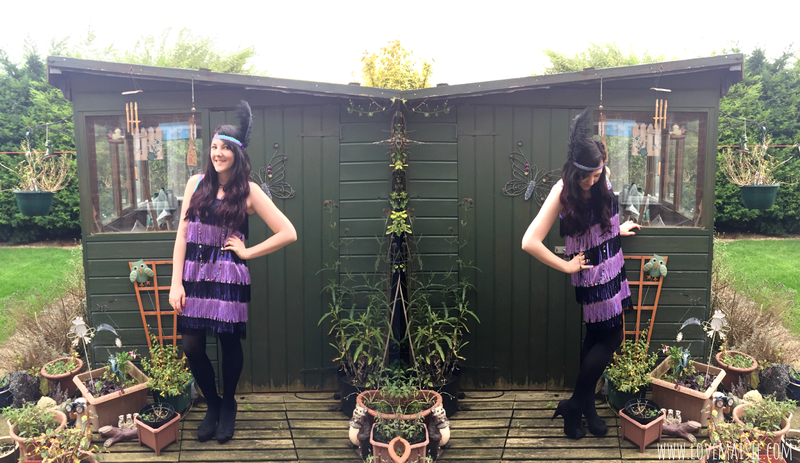 This gorgeous black and purple flapper dress also come’s complete with a sequined headband with a massive feather on it(love) which I think really helps to complete the look! I styled my costume simply with black tights, black heels and a purple and grey beaded necklace that I found in my mum’s spare room! As for my hair, long hair in the 20’s wasn’t really a “thing”, but I thought i’d still leave mine down and just curl/wave it a little, jazzy yeah? As for the sizing, I ordered a medium (advertised as a UK dress size 12-14) and it fits really comfortably. I’m a UK 8/10 and I really think this dress would fit anyone in those four sizes as it’s lose fitting and the material is stretchy. I absolutely adore this costume and now I wish I had a party to wear it to! (hint hint, if you’re having one, hit a girl up) If you are headed to a fancy dress New Year’s party this year, or any other fancy dress party, then why not check out Tickled Pink Fancy Dress. You can bag yourself 15% OFF your order by using the code SANTA15, woohoo! What do you think of my costume? Will you be dressing up any time soon? Let me know! *Disclaimer: Although this product was gifted to me by the above company, all opinions on the product are 100% honest and of my own and are not representative of the company. I would never give a false/misleading review of a product, no matter what relationship I have with the company.